The BACKHUS CON system is a combination of a membrane-covered CONVAERO process and a self-propelled BACKHUS turner. With moderate investment cost the site operation is cost efficient and low on emissions, according to Eggersmann. The Faruk Group is currently constructing a mechanical-biological waste treatment plant at Suleymaniyah for the production of alternative fuel (RDF) from 1,040 tonnes per day of MSW and commercial waste. The RDF produced will be used in the group's own cement plant. This large-scale project also includes a sanitary landfill with leachate collection for the processing residues. Faruk assigned the Eggersmann Group with the planning, supply and commissioning of the biological drying process phase. The deciding criteria were mainly the process reliability and the commercial efficiency. The scope of supply also includes a stationary primary shredder. With this latest development of its proven technologies and components for biological drying and composting, Eggersmann is bringing the treatment of organic waste and MSW to a new level. The innovative BACKHUS CON system is a combination of the membrane-covered CONVAERO process and the self-propelled BACKHUS turner. With moderate invest cost the site operation is cost efficient and low on emissions, according to Eggersmann. 22 drying lanes with aeration and membrane cover are being built on 40,000 m² of land at Suleymaniyah, northern Iraq. Each lane has a capacity of 2,600 m3 MSW and will be fitted with aeration and process control. The BACKHUS CON 100 is the world's largest turner with an effective operation width of 10.0 m and a total width of 14.5 m. It is fitted with tracks to run along the outside of the lane walls, while the waste will be turned within the lanes. 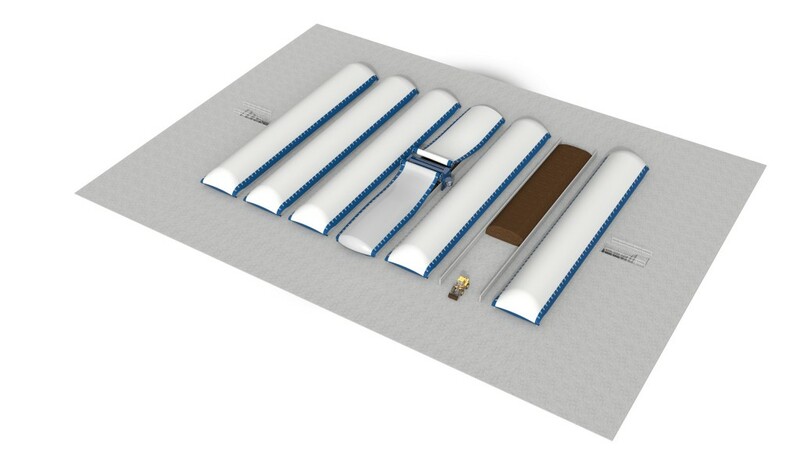 In addition, the BACKHUS CON is equipped with two membrane cover winders to simultaneously winding and unwinding membrane covers during turning. Since the system is effectively closed during turning, this method is particularly suitable for sites where emissions are a critical issue. A further advantage of the system is the short processing time. Even materials with a high moisture level and high density can be efficiently composted or dried. Left to right: Faruk Mustafa Rasool, Executive Board Chairman of the Faruk Group, and Karlgünter Eggersmann, Managing Director of the Eggersmann Group, after signing their contract, December 2018 in Suleymaniyah, Iraq. At the front end of the treatment process at the Suleymaniyah MBT, an Eggersmann single-shaft TEUTON ZS 55 shredder ensures continuous shredding and a uniform discharge of shredded waste to the conveyor systems towards the drying area. One TEUTON ZS 55 in two-shift operation is sufficient to cover the sites' daily throughput.